All the middle holes are there for accepting various types of ground (earth) pins. That is not a standard socket. That is entirely an invention of the Chinese junk sellers. It has not been approved by any competent testing laboratory, and it definitely never will. This type of socket is simply trying to adapt too many kinds of plugs, at the expense of safety, and it would not be able to be listed even if it was made by a competent builder. As such, the junk sellers don't even try to make a safe product. Hence the "for export only" sticker: export it to a jurisdiction we're not responsible for. Use a listed adapter made for your specific plug-socket pair. Note that UL, CSA, TUV, SGS, NTL, ETL etc. are marks of reputable testing agencies. CE is not a testing agency, nor is it reputable, as it allows manufacturers to self-test and self-certify, which turns the mark into “Chinese Excrement.” Relevant to electrical since so most of the world harmonizes to rules like US NEC, which require electrical equipment to be certified by a recognized testing lab. CE won't ever be one, for obvious reasons. John Ward on these… And his teardown. Your adapter is designed to acept a wide range of plug types, unfortunately this also tends to mean it accepts none of them well. The "for export only" label doesn't inspire confidence either. The holes you have circled in red are to accept the earth pins of the aforementioned wide variety of different plug types. Exactly what is hard to tell from the photo but I'm pretty sure at least UK, US and Australian plugs are supported by that hole combination. 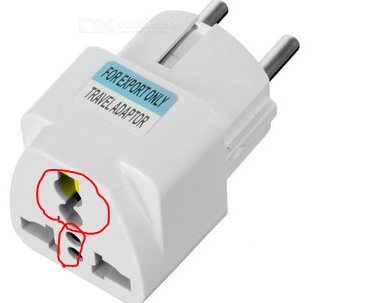 Depending on just how crappy the adapter in question is you may or may not find it actually provides an earth connection between the Earth contacts on the Schuko style plug and the earth pin holes in the socket. Check Wikipedia on plugs and sockets, to see the variation. I guess it makes a lot of sense to place the holes similar to what people are used to, and as far as I remember from that list (it's been a while since I spend hours reading through it), all plugs have the grounding pin placed symmetrically in relation to the live pins. And that has resulted in that layout. Not the answer you're looking for? Browse other questions tagged europe electronic-items power gear or ask your own question. Is there a standard power adaptor to use on airplanes? For US travel are Wireless mice banned? Where do you get a travel adaptor in Ireland?